BRW2017: Avo is the Perfect Place to Unwind Over a Fresh Meal! Enjoy a Southern take on Fresh Californian Cuisine! Once again Birmingham Restaurant Week took us to a place that we had heard a lot about, but hadn’t yet visited. Avo (pronounced “Ah-Voh”) is located in the heart of a bustling Mountain Brook intersection. It turns out that Avo is short for Avocado, a staple ingredient in a lot of the fresh, California inspired, dishes they serve up. 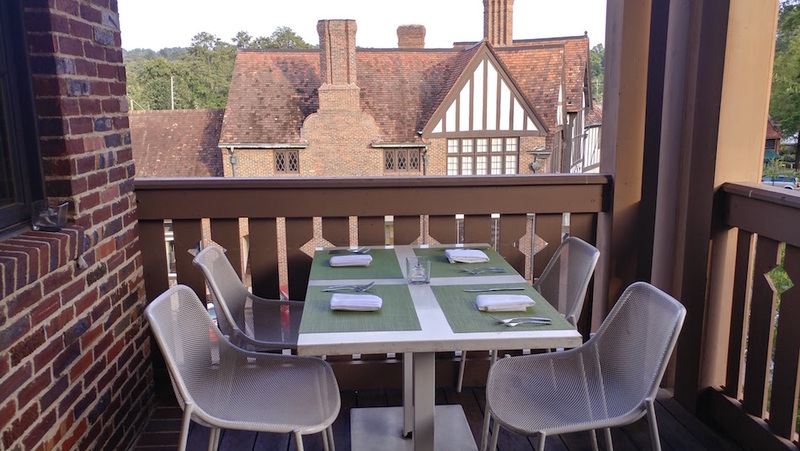 Avo is nestled atop Dram Whiskey Bar and offers up a great view along with your meal. Since we were having dinner, we opted to sit out on the deck so we could take advantage of the cool evening breeze as the sun began to set over the horizon. 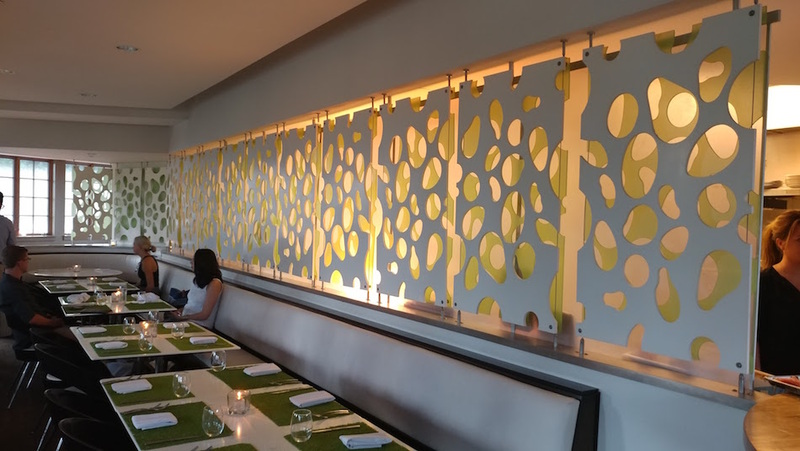 The atmosphere inside Avo has a minimalist modern look and feel. We especially loved the white and light green color scheme along with the fun placemats that give the table setting an organic feel. 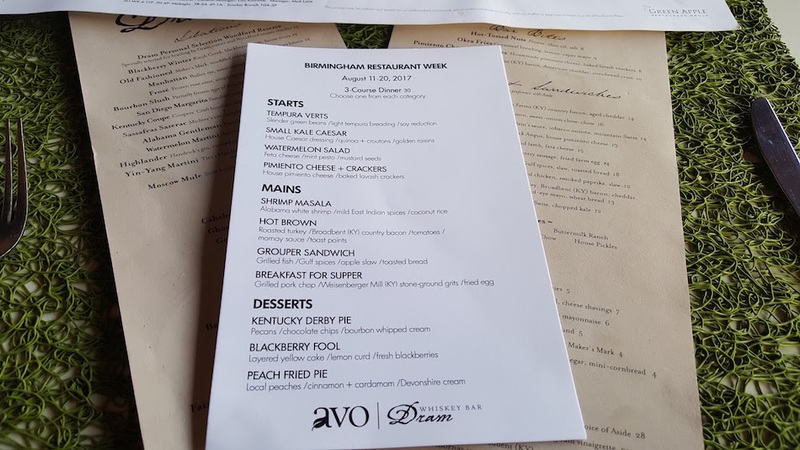 We immediately noticed that Avo’s #BRW2017 menu has plenty of options to choose from! This is a big plus if you are dining with more than two people since it gives you the ability to try a variety of items. Avo offers three large courses for a $30 price point. 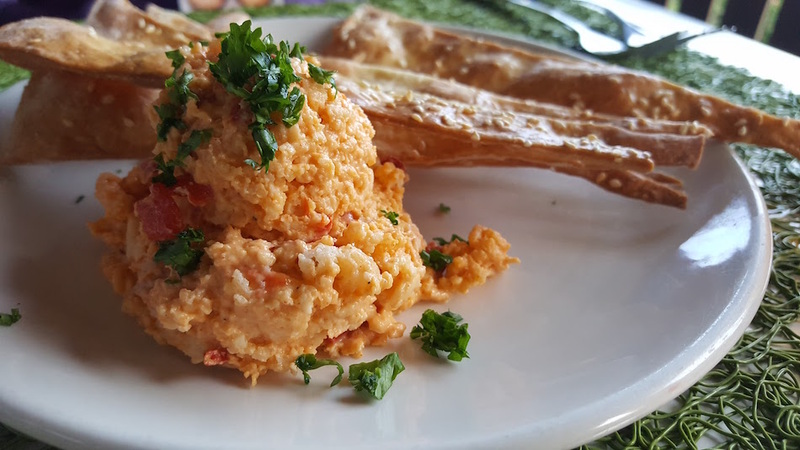 After looking over the menu we decided to try the Pimiento Cheese & Crackers for our first appetizer. The wedge shaped crackers were light and crisp, perfect for dipping. The Pimiento itself was full of flavor with a hint of fresh onion. There is plenty enough to share, especially if you break the large crackers into bite-sized pieces. Next up we tried the Tempura Verts. We weren’t prepared for the large portion we received! 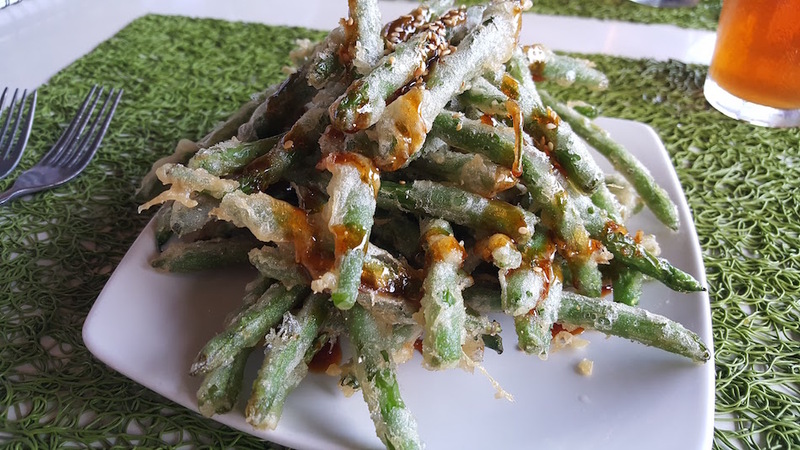 The plate was stacked high with long green beans, each lightly battered with a tempura breading and drizzled with a soy reduction. Eating this dish was like playing a delicious game of Jenga or Kerplunk! Just remember to save room for your next course as you’ll be tempted to eat waaaay too many of these! You should definitely share with friends. 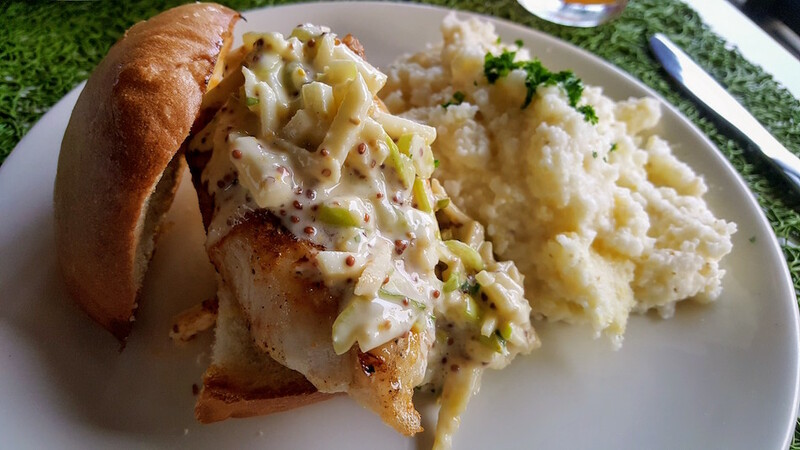 By now you probably realize that we love seafood, so naturally we ordered the Grouper Sandwich. It comes served on a toasted bun and is topped with a creamy apple slaw! Y’all, this dish makes you feel like you are eating on the coast of the 30A! For the side we opted to go with grits which were warm with just the right amount of butter flavor. The generous portion of grouper was perfectly cooked. We recommend eating this “sandwich” with a knife and fork. 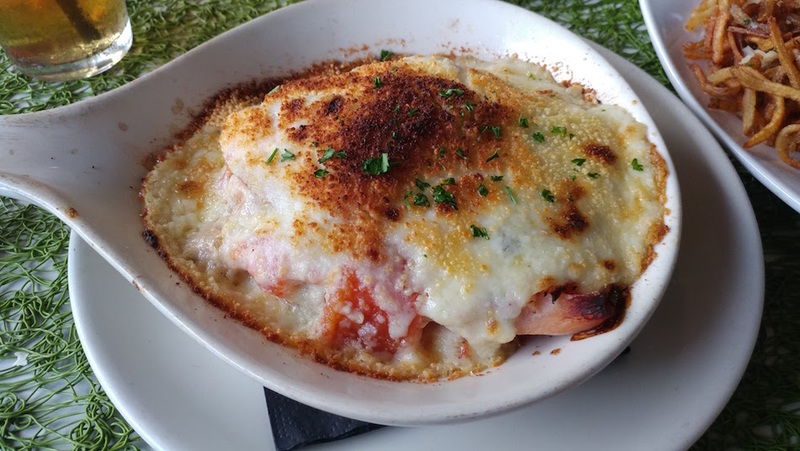 When we ordered the Hot Brown we didn’t really know what to expect. The name doesn’t really give too much away, so we were pleasantly surprised when the dish came served in a hot plate that was straight from the oven. The best way to describe this is an open-faced turkey sandwich, covered with all kinds of melted goodness, served piping hot. The dish has fresh tomatoes, crisp bacon, and momoy sauce! The turkey is cut in thick slices, but is so tender. Did we mention bacon? It’s amazing! There’s bread at the bottom of the dish that will have soaked up a lot of the flavor by the time you get down to it. The flavor reminded us of turkey cordon bleu. 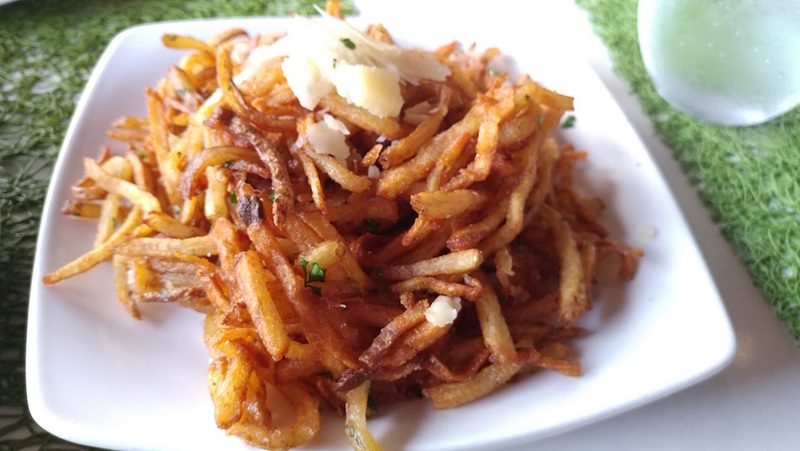 This dish is rich in flavor and is a must try for those who love food topped with melty cheese! Oh, and the Hot Brown came with a side of Ah-mazing Truffle Fries! We didn't even need ketchup! Somehow we saved a little room for dessert. 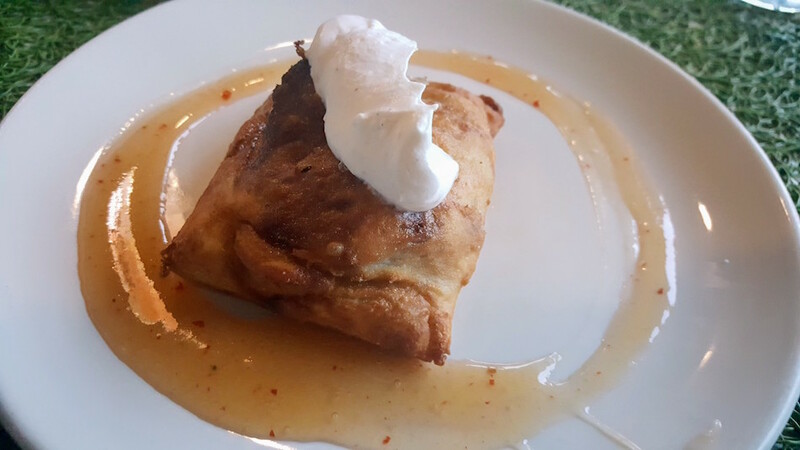 We ordered the Peach Fried Pie which comes as a fried pouch stuffed with local peaches, seasoned with cinnamon & cardamom, and served with a side of sweet Devonshire cream! This was the perfect sized portion after our heavy meal. 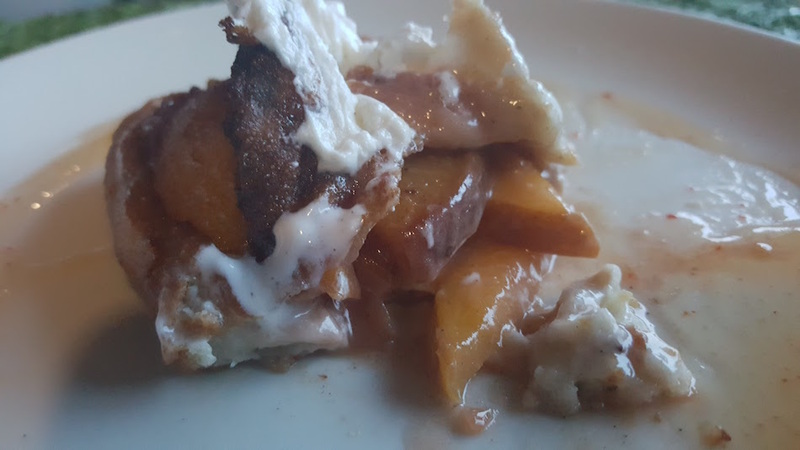 The peaches were both warm and fresh and the spices provided just the right amount of bite to balance out the sweet. Our second dessert was the Kentucky Derby Pie. 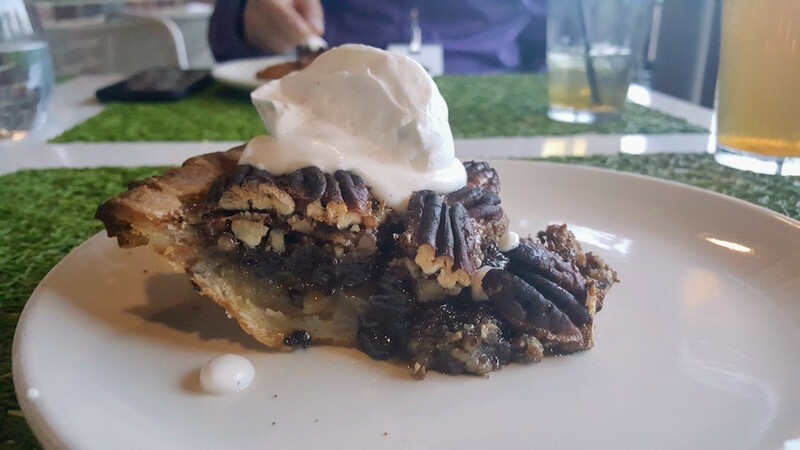 This large slice of pie is filled with pecans, chocolate chips, and a bourbon whipped cream! It is both rich and downright decadent. It’s like a pecan pie went through a chocolate factory...then a distillery. You can definitely taste the bourbon in this tasty treat! It makes us think that if you eat more than one, you may have to call an Uber. We enjoyed every part of our dining expereince at Avo and can’t wait to return. The service was stellar and clearly the food was top-notch! It’s always nice when a Restaurant Week visit makes you think, “Why have I not tried this place before now? !” This was certainly the case with our trip to Avo. Do yourself a favor: call some friends and head over to Avo before the end of #BRW2017. You’ll be glad you did!